Every day, students walk onto the Dowling campus to learn, study and hang out with their friends. Throughout the day, they talk to their teachers and feel the presence of the administration through the rules that they have to follow. Students know the teachers through their daily interactions in class. they know that the administrators are the ones that make the rules and make all of the important decisions and they know that the kitchen staff gets to school early to prepare their meals for the day but what many students don’t know is that Dowling many people work behind the scenes so that Dowling can continue to exist. Mrs. Boatwright, the print room operator, comes in every day in order to help teachers print what they need for the day. Mrs. Aina, the registrar, works hard every day doing many of the behind the scenes tasks. Mrs. Bowman, the Alumni Coordinator and the Major Gift Officer, works to plan events for the Dowling community especially the alumni and the major gift donors. Ms. Boatwright prints worksheets for the teachers. Ms. Boatwright helps the teachers and the administration every day as she prints, cuts, and staples papers for them. She spends her day in the Print Room and talking to her coworkers. 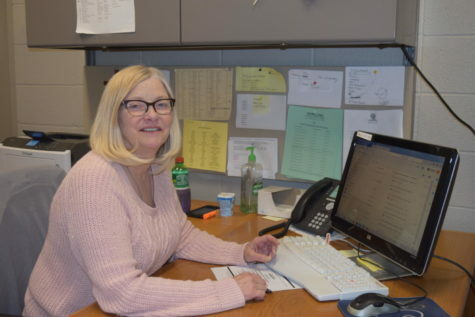 “I kinda call this my retirement job, so it is fun I get to come in and visit with people and not have to get too stressed out about what I am doing anymore,” Boatwright said. Boatwright is able to enjoy her workdays by not having to stress while doing her job. 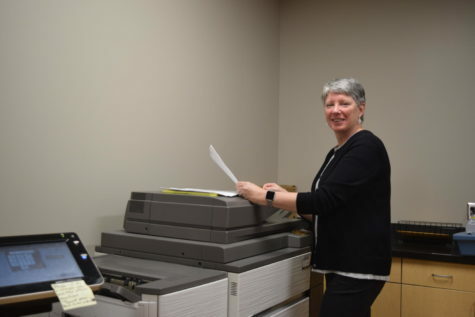 “I used to work in the business office about 10 years ago, so I have always worked around office equipment so using these big machines is not a problem for me,” Boatwright said. Ms. Aina uptades student transcripts and does all of the behind the scenes work that we don’t see. Students know that the teachers are the ones that give them their grades, but what they don’t know is that Ms. Aina is the person that deals with their records after they finish a class. “[The] registrar is known as the grade lady, so I keep track of everyone’s student records and historical grade information,” Ms. Aina said. As well as dealing with student records, Aina also does a large majority of the behind the scenes jobs for the academic events. “[I work] behind the scenes for the academic awards ceremony and then I do a lot of the preparation for graduation. I build the seating charts and order everybody’s caps and gowns and get their honor chords ready, gather the names for the program, that sort of thing,” Aina said. Ms. Aina is used to being behind the scenes. She spends her days in her office planning and sending records to employers. “I may not help them today but in the future after they graduate. I do educational background checks for both employers, military and the government. Whenever a student needs an official transcript I am the person that helps them as that comes to scholarships or whatever,” Aina said. Ms. Bowman communicates with the alumni and major gifts donors of Dowling. About 8 months ago Dowling hired Ms. Bowman. She is the helps Dowling in her role as Major Gift Officer and as the Alumni Coordinator. Day to day, she works to help the alumni and the major gift donors of Dowling. 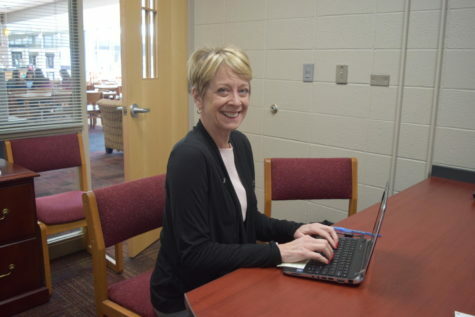 As the Alumni Coordinator, she finds and creates ways for the alumni to stay current with the happenings at Dowling. This includes sending out newsletters and creating events in which alumni are recognized. Many former Dowling athletes are invited back to remember their time at Dowling. “One [part of my job] is engaging our alumni across the country in ways that might be meaningful for them, through communications about activities, helping identify opportunities to communicate with our alumni about things that are happening currently at Dowling,” Bowman said. In her role as Major Gift Officer, Mrs. Bowman works to ensure that donors that donate a lot of money to school are treated correctly.